[00:54:45] <Ziegler> are O words only used in EMC? [00:55:09] <Ziegler> for subroutines and the sort? [01:01:41] <Ziegler> Lerman was it you who came up with O Words? [01:02:23] <lerman> I picked the letter 'O' because it wasn't already used by EMC. [01:02:34] <lerman> They are not part of the standard. [02:50:03] <LawrenceG> no... I am getting the depth dialled in, so the lines are very fine.... chris... did you make a vacuum table for pcbs? [02:51:18] <skunkworks> jmk-wvm: did you end up making a video of the fusee? [02:53:59] <tomp> following error should be constant after accel at a given speed, today i was called in to lookat a machine whose X wasn't smooth. at top vel it had a FE of 0.400mm +/- 1um but in a certain area it jiggled as much as 50um... worn screw! [03:56:41] <eric_U> what does that mean? [03:57:37] <gezar> he said, as an example, he doesnt want to teach why statemnts in shell scripting do what they do, just that the statements do what they do this way. period. [03:57:54] <gezar> does that make sense? [04:00:41] <eric_U> that's senior level comp sci? [04:07:20] <eric_U> SWPadnos, no assembly? [04:08:02] <gezar> any strong upgrades to 3mc? [04:08:17] <eric_U> is 3mc the leet version? [04:09:54] <SWPadnos> for a microprocessors/embedded class? [04:11:43] <gezar> he has you to help him right? [04:11:53] <gezar> I mean your able to assist and direct him to some extent? [04:25:59] <SkinnypuppY34> I don't suppose you can unscrew and reverse a ballscrew without balls going everywhere can you? [04:27:19] <SkinnypuppY34> Thanks didn't want to do something stupid. [04:28:15] <SkinnypuppY34> There's an Idea, I may could use the length I have to part off to reverse the nut to the shaft I want to keep. [04:29:22] <SkinnypuppY34> Hmm didn't know that. [04:36:35] <SkinnypuppY34> No problem. I'm well versed in items that fall from what you are taking apart. [04:37:15] <SkinnypuppY34> Yep I did grey epoxy and I love it . [04:39:50] <eric_U> how robust is the epoxy, can I move my machines around on it? [04:40:42] <SkinnypuppY34> Slide around, no ... However I did roll around a 17" lathe with an 8 ft bed on steel pipes without damage. [14:34:31] <terrylr> rayh, hello, long time no read. how goes it? [14:45:17] <terrylr> rayh, how goes it? [14:46:16] <terrylr> rayh, that is good to read. [14:46:28] <rayh> How about you. [14:46:36] <terrylr> rayh, i just thought i drop in for a visit. [14:47:05] <terrylr> rayh, the past several years have been hard years. [14:47:32] <terrylr> remove from the accident scene. haivng two broken legs is not fun. [14:48:06] <terrylr> rayh, right now i am learning how to walk again. would like to get out of this wheelchair. [14:48:08] <rayh> You have had a run of bad luck, guy. [14:49:10] <rayh> I was thinking about your cat walking the keyboard thing this morning. Still got the cats? [14:50:08] <terrylr> rayh, just one cat left. my grandpa cat died in 2006, junior cat died june 2007. grandma cat, who will be 19yo the end of march, is still here. [14:50:43] <terrylr> rayh, huckleberry finn, my dog, died feb 11, 2005. [14:51:01] <rayh> Sorry to hear that. [14:51:23] <terrylr> rayh, right now i can barely take care of myself so another pet is not on the horizon. [14:51:36] <rayh> I can hear that. [14:54:08] <terrylr> rayh, pretty much lost interest in computers and programming. my hardware is all old and dying. lost two main hard drives in the past month. strauss and johann (computers) are both down. this one i am using was an old computer one of the people in efnet/#linuxgeneration had and sent to me. [14:54:38] <terrylr> rayh, the medical bills are going to wipe me out. [14:56:45] <terrylr> rayh, been doing some tinsmithing and mostly cooking and baking. [14:57:31] <terrylr> rayh, take long lasting morphine for the pain. [14:57:49] <rayh> pump or pills? [14:58:45] <rayh> been there done that both. difficult to get away from. [15:03:44] <terrylr> rayh, right now pills. got off the pump back in september. [15:08:51] <terrylr> rayh, you still going to names every year? [15:11:34] <terrylr> rayh, names may not have many visitors this year with the economy in the dump and gasoline prices going toward $4.00 usd per gallon. in some ways i am glad i have been driving since the 6 aug 2007 accident i other ways i do miss the independence. having to arrange for a handicapped ride to go to the grocery store is getting old. getting out of the house even if it is just to the grocery store is nice though. [15:12:07] <terrylr> rayh, thank god the house is a ranch. no stairs to deal with. [15:13:00] <terrylr> rayh, just babbling here. aimless chatter of an old man. [15:25:22] <rayh> NAMES shut me out the last year they were in Taylor. Refused electricity for the open display model. [15:25:45] <rayh> I never even took my stuff out of the car. Most of the other guys didn't either. [15:28:15] <terrylr> rayh, i did not realize that names has gone downhill in the past several years. that is sorry to hear. [15:29:15] <rayh> Yea. Cabin Fever has taken up some of the CNC stuff. [15:29:15] <terrylr> rayh, roland's place is probably 3 hrs from me. might as well be 1000 miles though. long vehicle rides and i still do not do well. [15:35:34] <terrylr> SWPadnos, that was a long time ago. [15:36:04] <terrylr> SWPadnos, at least 6 to 7 years ago. [15:36:47] <terrylr> SWPadnos, actually it may be longer than that. [15:37:09] <terrylr> SWPadnos, back before all the accidents i had bleeding edge stuff. [15:37:10] <SWPadnos> yeah, it's 2008 already. when did that happen? [15:42:42] <bill20r3> jetpacks for everyone! [15:43:28] <bill20r3> ok, just a jetpack for me. [15:45:36] <bill20r3> I'll cut my commute time in half. [15:48:20] <SWPadnos> terrylr, was the alpha work done on Linux or on one of the $$$ unixes? [15:48:43] <SWPadnos> cool. was it RT, or sim/userspace apps only? [15:49:42] <SWPadnos> nice - was there RTLinux or RTAI for Alpha at the time? [15:50:21] <terrylr> SWPadnos, the alpha work was difficult. the one alpha cpu would never work with rt linux. that cpu had a design flaw. the hardware interrupts did not work. there was no way for rt linux to hook in. [15:50:45] <SWPadnos> hmmm. was that one of the "PC" versions of the chip? [15:50:54] <terrylr> SWPadnos, only rt linux at the time. [15:51:16] <terrylr> SWPadnos, no, just a design flaw. [15:52:05] <SWPadnos> hmmm what was that low end board? the HDAMA or something? [15:52:20] <terrylr> SWPadnos, many people unformautnately had that cpu. people offered to throw money at me if i could make it work. i kept telling them it would not work. [15:52:36] <terrylr> SWPadnos, the multi box something. [15:52:50] <SWPadnos> oh, did you have a dual-CPU system? [15:55:40] <terrylr> SWPadnos, my alpha was a single cpu. from microway computers. [15:56:29] <terrylr> SWPadnos, i still have the alpha. do not boot it much any more. it was 500 mhz which was the fastest cpu out at the time. [15:59:05] <SWPadnos> heh. from a post on the CCED group: "IMO using a laptop to run CNC in a shop is like driving nails with French Bread. Wrong tool for the job." [15:59:20] <terrylr> SWPadnos, all my old sparcs i powered up on summer out on the west end of my lawn and then i proceeded to shoot them with a 20 gauge shotgun loaded with deer slugs. took out my frustrations on them. amazing what a harddrive which is rotating at 7200 rpm does when hit with a deer slug. [15:59:43] <terrylr> SWPadnos, who posted that? [16:02:37] <terrylr> well it has been fun, but physical torture calls . this physical torture person enjoys their work far too much. [18:28:40] <jensor> Since I upgraded to version emc 2.2.3, I am now occasionally getting the following error: "RTAPI:ERROR: Unexpected realtime delay on task 1". What needs to be done to cure this problem? [18:33:48] <SWPadnos> occasionally as in "sometimes at EMC23 startup" or occasionally as in "from time to time, when I'm running a part"? [18:41:33] <skunkworks_> you should run latency-test for a while from termal and look at the jitter..
[18:45:31] <jensor> When I originally installe4d emc I had to modify the kernal because my intel motherboard caused latency probs. Paul Corner graciously guided me through that process and we overcame the excessive latency. If I remember the latency I ended up with was about 15uS. [18:55:19] <jensor> I am now currently running the latency test. [19:17:50] <jensor> Now its been about 15 min, have no over runs, highest latency is 12.98 Us so far. [19:30:25] <skunkworks_> drag windows around and such..
[19:30:54] <skunkworks_> you could also run glxgears from terminal. [19:43:00] <jensor> Now up to 20.98 Us. [19:43:12] <jensor> what is glxgears? [19:44:22] <skunkworks_> what is your base period set to? [19:52:49] <skunkworks_> what is it up too now? [19:56:19] <jensor> have 2 glxgears running, 2 browser windows open, one streaming a video its now up to 33.163 Us. [20:00:43] <skunkworks_> I don't know - but that is getting dangorously close to your 50us base period.. I could see it causing issues..
[20:15:47] <skunkworks_> Jepler! how is it going? [20:16:29] <jepler> skunkworks_: pretty good -- I've just spent more time away from the computer lately. [20:22:21] <skunkworks_> I just spent 7 days only touching a computer twice..
[20:22:44] <lerman> I just installed emc2.2.2 iso on a new machine and have some questions. [20:23:25] <lerman> Do you generally install all the updates that ubuntu recommends? [20:23:48] <lerman> Does the ubuntu updater also handle the update to emc2.2.3? [20:24:05] <lerman> Thanks, cradek. I'll go do that. [20:25:15] <skunkworks_> cradek: could I borrow a $1000? [20:25:35] <skunkworks_> darn - thought you where on a roll..
[20:26:44] <skunkworks_> I thought so..
[20:27:15] <skunkworks_> last picture shows the livecd booting.. But - darn it all - looks like he is using something else to test. [20:32:27] <jensor> well, the pc crashed after I restarted the latency test - when I went back to it, it had rebooted! 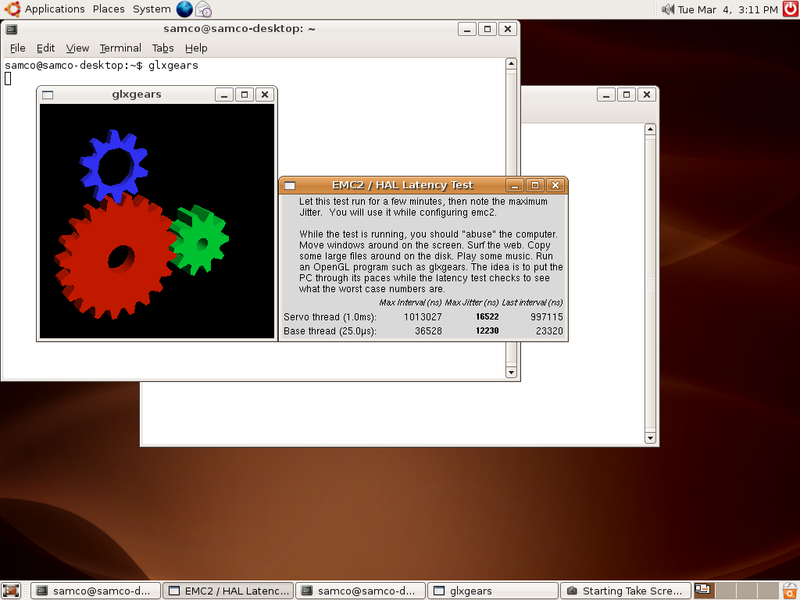 [20:35:03] <skunkworks_> cradek: how do you run a opengl screensaver - I know that the glxgears caused a couple of my machines to reboot. [21:21:21] <micges> how to delete image on wiki ? [21:22:24] <skunkworks_> I don't think you can..
[21:22:52] <skunkworks_> Upload a new one named different. I think alex_joni or SWPadnos can do it..
[21:57:07] <tomp> try uploading with same name, it it works, it overwrote the file. [21:59:50] <lerman> Oh CVS guru. Can you help me? [22:00:47] <lerman> I cant seem to do a checkout (non-anon), but I used to be able to. I'm doing this from my newly installed machine. [22:01:11] <cradek> did you copy over the ssh key? [22:01:13] <lerman> I suspect it has something to do with my private key, but don't know how to get it from my other machine. [22:07:33] <lerman> cradek: NG. It appears I don't know which machine I did that from -- or perhaps no longer have access to it. [22:07:47] <lerman> Who do I see to register a new key for lerman? [22:08:18] <cradek> lerman: if you send me a new key, I'll install it. But I have to run right now. I'll do it later tonight. [22:08:29] <lerman> How do I generate it? [23:16:27] <tomp> micges: i dont think the .axisrc file is the right place, maybe in .../bin/axis? and, you might want to discuss this with the developers. [23:42:18] <tomp> is .axisrc something you created?